Over on WUWT a person was tossing rocks at the idea that one could extract enough Uranium from sea water to run the world. He was not particularly tuned in to just how big the world, and our industry, is; and was holding up the size of facilities needed as a show stopper. In presenting a “thought experiment” to show that the size was manageable and even less than what we presently do with oil, I hit on the idea of a Uranium Mining Ship. For now, I’m going to accept his figure for world U demand, but this will be revised later. His calculations led to the need for 48 million tons of absorbent polymer to extract U and felt that this was a preposterous size. The world requirement is therefore for 48Mtonnes of polymer to extract uranium from sea water. We make about 200 M tons of polymer per year. So 1% would be 2 M tons. If we were willing to use that quantity, we could build out that 48 M tons of polymer in 24 years. That’s a reasonable length of time to build an infrastructure suitable for powering the entire planet. I’m going to accept that number and show that it isn’t hard to do, and could even be done in a scale that would fit in ships. The world is a very big place. That 1% of present world polymer production for 24 years is a reasonable run rate. (You are not thinking of building this out all at once are you? That would be silly. Not enough nuke plants yet and too much land sourced U to justify that. Heck, even 24 years is pushing it…) So polymer source is not an issue. Global supply changes by more than 1% for minor changes in the economy. What if we wanted to dunk it in the ocean? This collector can be placed in many slow natural currents or even modest tidal areas. It takes a year to soak out the U so you don’t exactly need a swift river here.. So how big would this structure be if it was collecting a world worth of Uranium? Would it be big enough to slow ocean currents? Coast lines are fractal so this means they are theoretically infinite in length. The U.S. Coastline, for example, is estimated as being anywhere from about 9000 miles to 90,000 miles. Kind of unhelpful. Lets assume that we will simply take a straight line from one pole to the other next to the major continents. That’s about 12,000 miles one way one coast. I know it’s a way under estimate, but hey, that’s good, right? Americas East, Americas West, Asia / Australia, Europe / Africa west, Africa east / India. I make that about 5 x 12,000 or 60,000 miles. Now again we’re way underestimating. No islands. No wiggling back and forth. Ignoring Antarctica. Ignoring all that open water with deep currents in all that 70% of water we’re ignoring. Probably a factor of 10. Divide your tons by those miles and you get 800 tons / mile or about 7 ft per ton. Given their demo device was about 350 kg, and was 8 m wide, we need to make it about 3 times that size, call it 24 m to get a ton. Now this 24 m wide blanket needs to fit in that 7 ft, but was also 8 m thick, so we need about 3 x as much blanket per foot. Lets call it 75 m. The other dimension was 30 m so were talking about a 75 m wide, 30 m tall band. Now last time I looked, a 75 m wide stripe off shore was not very big. Last time I was in the ocean, 30 m (about 100 ft) of depth was barely getting your scuba gear wet. But that is still a large structure. It is also diffuse, exposed to many different ocean conditions, and is something that navigation and fishing would need to avoid. More likely we would pack it into a smaller physical extent. Fold it back on itself into a less diffuse package. The purpose of this thought experiment is just to show how puny the impact would be on the ocean currents. Miles wide and thousands of feet deep ocean flows will not be upset by a few dozen feet wide and deep ribbon that is mostly empty space. How big is this compared to oil and oil tankers? To put things in perspective on the size of the polymer and it’s impact on the ocean in an Ocean Uranium Mining system, consider oil. Oil and plastic are nearly the same density. Close enough for one or two digits of precision. So what if all that polymer were put in oil tankers? How does this 48 Million DWT stack up to oil? 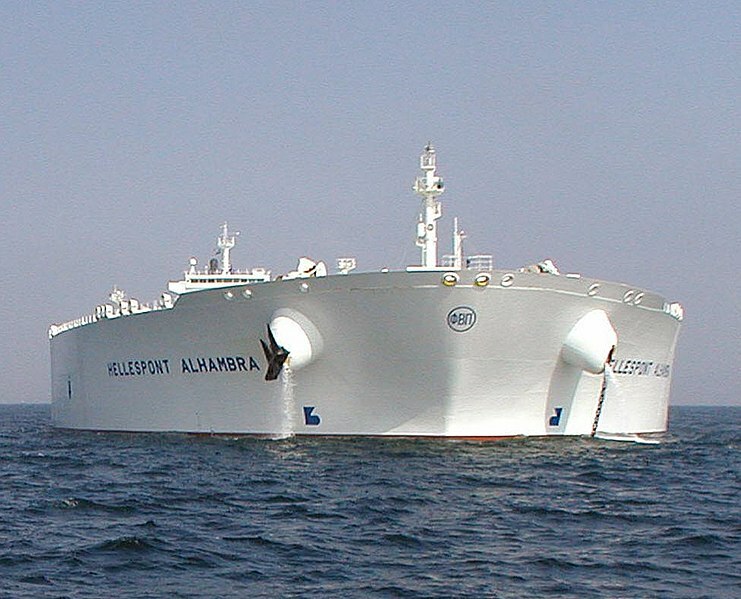 We presently have 960 million DWT of tankers (per wiki ) so we’re talking about roughly 1/20 th the size of the present oil tanker fleet. Each year we shove, roughly, 2.4 BILLION tons of oil through the ocean in tankers (multiple trips) using large engines and giant screws to stir up the water. So putting a plastic blankey in the water is not going to be a problem. So Why Not Make an Ultra Large Uranium Miner ship? Say we wanted a 1/2 void filter bed. That would make it 250,000 DWT of filter in a ship. Given the yield they got ( 1 kg / 350kg of filter / year) that ought to give about 714,000 kg of U per year. At $150 / lb (high for now, but we’re talking when the land stuff is scarce) that’s $235,620,000 per year or about $645,000 / day. Day rates on a tanker are often in the $50,000 to $100,000 scale, so we’re in big profit land. I’m also pretty sure we will not be using a significant part of that 714,000 kg of U to power the nuclear engine for a year. I’d estimate it at about a fraction of 1% needed to power the whole thing. It looks to me like it could be very profitable when uranium rises to the $150+ level. It is worth mentioning that the resin / polymer can be reused. It is not destroyed in this process, so after the system is built out, the resin demand drops off. I really like the idea of the ULUM class of ships 8-) using 1/10 the the present fleet size of the oil tankers to power the entire worlds electric needs has a certain charm to it… and it would take about 1/20 the the volume of hydrocarbon that is presently sitting in that crude carrier fleet, transformed into plastics, rather than burned up. This is all a very manageable scale. A nuclear powered ship doing, oh, 3 knots? would take darned near no power at all to run. Having the polymer in standard bins would allow easy automated processing (I’d probably go for beads rather than blankets so it could be moved via pumping, but that’s an engineering choice.) The whole thing just cruising slowly around and every so often a ‘tender’ comes out to pick up the ‘yellowcake’ it has harvested and swap in some new processing chemicals. I could easily see a ULUM ship as a factory ship. Making it’s own water and electricity and only needing resupply for specific processing chemicals and a resin reload from time to time. There is an engineering choice of whether to use the forward motion of the ship, or dedicated sea water pumps, to move water over the filter bed. There is also a choice as to blanket, beads, or some other physical form; that will then dictate the handling equipment aboard ship. It would require handling about 40 tons per hour for on board processing to “yellowcake”. A fairly small size by industrial standards. All in all, not too hard to build and operate. Postscript: Should anyone wish to use this idea and actually build an ULUM ship, you are free to do so. A brief footnote of attribution would be appreciated. Attendance at the launch / dedication would be a ‘nice touch’ but is optional. E. M. Smith. This entry was posted in Earth Sciences, Economics - Trading - and Money, Favorites, Science Bits, World Economics and tagged Engineering, resources, science. Bookmark the permalink. What’s (Watt’s?) even more interesting about the link you so kindly supplied to the Japanese test rig, is the concentration of Lithium in seawater, at 170 mg/tonne. During evaporation of sea water to provide salt the uranium would be concentrated in a localised area. Would the blanket work better (quicker) at a higher U concentration? In the case of higher concentrations there are probably better methods. U concentration in seawater/salt concentration in sea water. I have no idea what the limits are on the absorber. While I would expect it to work better in brine, that is an unfounded assumption on my part. We literally through away more fuel in the ash than we burned up in the coal, for want of a way to get the U out. Chelation therapy is an optimal method to reduce the radionuclide-related risks. In the case of uranium incorporation, the treatment of choice is so far i.v infusion of a 1.4% sodium bicarbonate solution, but the efficacy has been proved to be not very high. In this study, we examine the efficacy of some substances: bicarbonate, citrate, diethylenetriamine pentaacetic acid (DTPA), ethidronate (EHBP) and inositol hexaphosphate (phytic acid) to chelate uranium using a test developed by Braun et al. Different concentrations of phytic acid, an abundant component of plant seeds that is widely distributed in animal cells and tissues in substantial levels, were tested and compared to the same concentrations of sodium citrate, bicarbonate, EHBP and DTPA. The results showed a strong affinity of inositol hexaphosphate for uranium, suggesting that it could be an effective chelating agent for uranium in vivo. These are water soluble but it seems that most things can be attached to the stationary phase for liquid chromatography columns (eg proteins). Some organisms, such as the lichen Trapelia involuta or microorganisms such as the bacterium Citrobacter, can absorb concentrations of uranium that are up to 300 times higher than in their environment. Citrobacter species absorb uranyl ions when given glycerol phosphate (or other similar organic phosphates). After one day, one gram of bacteria can encrust themselves with nine grams of uranyl phosphate crystals; this creates the possibility that these organisms could be used in bioremediation to decontaminate uranium-polluted water. Metals have phosphates of low water solubility e.g. Cd, Pb, Cu, Mn, Sr, U, La, Pu, Am and Np, are removed from water by reaction with phosphate produced by enzymatically-cleaved polyphosphate which has been accumulated by one or more polyphosphate-accumulating microorganisms. (Patent describes a non-glycerol related mechanism). If the U concentration is very low it will not overcome the ‘solubility product’ for the phosphate salt and precipitation will not occur. However, dissolving uranyl from ash would give a higher concentration which might be more amenable. The nuclear industry uses tributyl phosphate as a chelating agent for uranyl and chemistry may win out over the microbes anyway. Is this the uranyl phosphate you refer to? The solubility product of NaUO2PO4· x H2O was determined in phosphate containing solutions at low pCH+ values in the absence of carbonate and at higher pCH+ values in the presence of carbonate. NaUO2PO4· x H2O exhibited very low solubilities (∼10−7 M in U) over a broad range of hydrogen ion concentrations, NaNO3 concentrations and in the absence of added carbonate. Not sure what M in U means but I suppose it’s that no precipitation occurs if [U]<10^-7 M. It looks as though [U] in seawater is around 3×10^-6 g/L which looks like around 10^-8 M to me. So, no precipitation if that's correct. Seawater evaporating in a salt pan would eventually reach high enough concentrations, but so would the salt which would presumably kill the Citrobacter. Or do they like salt as well as U? The solubility product is [U] x [PO4] (in this example) so theoretically a very high [PO4] would still enable precipitation to occur. The thing is that the flux of new U ions into the crystal nucleating area (where the [PO4] is highest) would too low to render the rate sustainable. One of the advantages of the Citrobacter system IIRC is that the mechanism was enzymatic – cleavage of the glycerol phosphate – and that it continued to work in non-growing, possibly even non-living cells. This contrasts with the patent above as polyphosphate is part of the active metabolism of microbes. I’m not sure about the effect of salt. It may have inhibitory effects on the enzyme system. It is also possible that at high salinity would stabilise the ions. In such an evaporative system, carbonates (magnesium; calcium in the seawater) would be likely to form and precipitates would be mixed therefore the advantage of selective precipitation would be lost. Uranium enrichment is very expensive, nuclear fission is unsafe, produce a lot of radioactive wastes. Aneutronic nuclear fusion is safer and cleaner, it is neutron-free. The urge to assign an ephemeral “goodness / badness” gradient to energy technologies is a thought pathology, and ought not be indulged in by those able to write cogently on the subject. Visualize mankind’s protohuman precursors…still mere animals….wedding themselves to fire, to crude mining, and in the process becoming human. Absent the energy source, and the found minerals, there would be no human race to pass judgement on what caused us in the first place. How “good” was it for early man to breathe soot, cut down forests, enslave other tribes as miners-until-death in copper pits, and in the process burn out the entire continent of Australia, as well as permanently denuding China & the Mediterranean ? Was it “good” or was it “bad” ? Good/bad isn’t applicable to these events. Nor is it applicable to the use of neutronic heat embedded in actinide minerals. That heat is just heat, and has no moral dimension. What does have moral implications, is the avoidance of viable technologies as a sop to political memes, dooming millions to stunted lives, so that we might avoid offending anyone. I’d call causing humans to die of hunger a fairly major offense, orders of magnitude more shameful than praising the use of uranium. From T7 Chuckles has a pointer to an improved adsorbent.